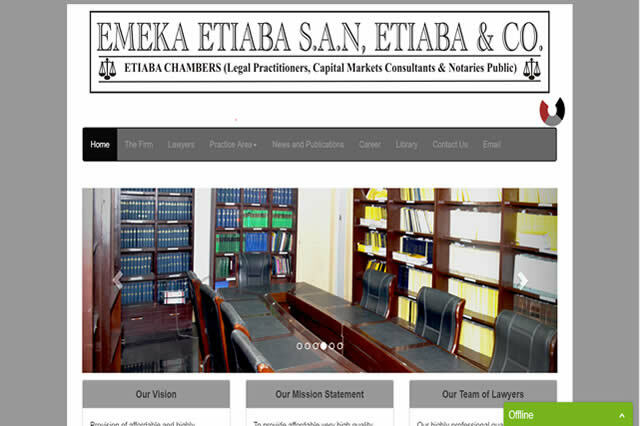 EMEKA ETIABA & CO., Etiaba Chambers is an off shoot of Etiaba Chambers that was established by Late Barrister B.M.C. Etiaba (of Blessed Memory) in 1960 as a sole practice in Aba, now Abia State. The initial Firm of Etiaba Chambers became inactive for over fifteen years when the late founder took to Magistracy between 1964 and 1979. He retired volutarily as a C hief Magistrate and resuscitated the practice until his death in 1987. Visit EMEKA ETIABA & CO Website For More Details.